Following the horrendous Grenfell Tower Fire in London the community response was unprecedented; there was a phenomenal outpouring of generosity and an overwhelming show of compassion. The huge level of donations (an estimated 174 tonnes of goods) has meant that the local council has needed to use a large warehouse in North East London to store them. The Red Cross was asked to support in sorting and distributing these donations to those affected by the fire, and by distributing excess donations to our shops for sale. Approximately 200 shops across the UK are now selling these donations and all items are labelled with ‘Shop for Grenfell’. All money raised will go to the London Fire Relief Fund. Stock to be distributed to our Red Cross shops in the north of the UK was transported to their Winsford warehouse to be sorted and prepared for distribution. This is where JLR colleagues stepped in to help. The Winsford warehouse held around 40,000 boxes, or 107 lorry loads, or three football pitches, worth of donations. These excess donations (much more than the victims could use) needed to find new homes so they did not go to waste. The Red Cross shipped up the goods to Winsford but were then left with the massive task of sorting and onward distribution. 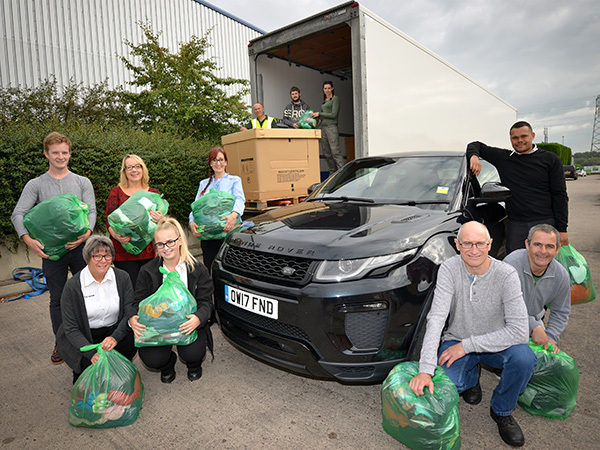 So on Tuesday last week a group of JLR colleagues travelled to the depot to help sort and bag up the donations. The Red Cross Retail Team said: “It goes without saying that without your help from the beginning of the process, and your flexibility and willingness to help us in a tight spot, that this just would not have been possible. Huge thanks to everyone involved from everyone here in the Red Cross Retail team.” The team from Halewood included: Michelle Kelly, Finance; Mel Wildman, Finance; Chris Lamb, MP&L; Gabrielle Deane, MP&L; Colin Fletcher, MP&L; Chantel Brown, MP&L; Christopher Larson, Quality; Tom Cotterill, Apprentice and Ellie Power, Apprentice. Our team helped sort and prepare the donations for further distribution to Red Cross shops. They spent the day sorting through large volumes of items and sorting them into manageable and identifiable categories for easy identification and easy display at their future destinations for sale. Well done Halewood team. Your support will help ensure that every penny raised from the sale of donated goods in Red Cross stores will go directly to help those affected. The British Red Cross helps people in crisis, whoever and wherever they are. They are part of a global voluntary network, responding to conflicts, natural disasters and individual emergencies.